32 pages. Softcover. Price: Free! GURPS in 32 pages! FREE! 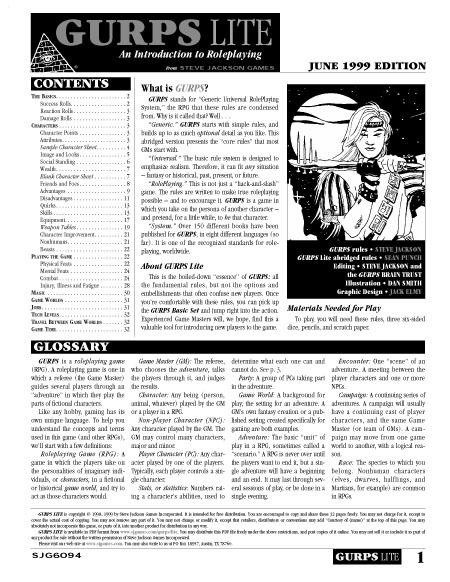 GURPS Lite is a 32-page distillation of the basic GURPS rules. It covers the essentials of character creation, combat, success rolls, magic, adventuring, and game mastering. It's available free from e23. You are welcome to copy and distribute it freely, within the restrictions found at the bottom of p. 1 of GURPS Lite itself. It has also been included in some GURPS books, such as the Discworld Roleplaying Game. Here's an Italian version of GURPS Lite. Layout and supervision by Andrea Minini Saldini. Translation by Yuri Abietti, Paolo Barberis, Marco De Stefani, Ambrogio Di Renzo, Fabio Milito Pagliara, Alessandro Noviello, Pier Luigi Rocco, and Mario Tani. And here's the German GURPS Lite, courtesy of the crew at Pegasus Games. 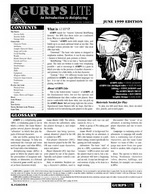 GURPS Basic Set – The complete official core rules for GURPS Third Edition, Revised.